Please see the separate link, WEDDINGS, in the main links near the top of the website (the little black squares). All the information for getting married at St. Therese can be found there. 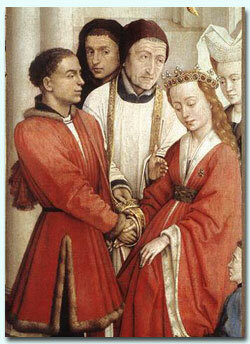 If you want more information about an annulment, see the link to the left, MARRIAGE ANNULMENTS. A Church annulment is a process that occurs after a Marriage Tribunal examines a marriage and determines that it was never, in fact, a Sacramental union. It does not affect the legal status of the marriage nor the status of any children born of the marriage. It only ascertains that a marriage did not have the characteristics necessary to be regarded as a Sacrament, i.e., being an outward and visible sign of inward and spiritual divine grace.